Do you have another model Chevy for sale? UsedCorvettesForSale.com is offering free ads to buy and sell all model Chevrolets on ChevyTrader.com including Corvettes. Buy and sell Chevy's including Corvette. 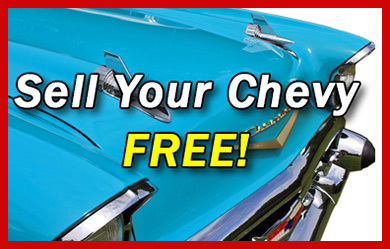 No charge to sell your Chevy! Classic, Antique, Muscle, Late Model Chevrolets including Corvettes. Buyers browse by Chevrolet model and category or use our Advanced Search to search for Chevys by location or keywords. Sellers can place a free ad, including photos, to quickly sell their Chevy. Scam Alert! Please view this page to read about recent scam attempts. If you have any additional question please feel free to contact us.